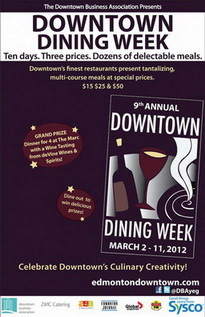 From March 2-11, 2012, the Downtown Busness Assocation presents the 9th Annual Downtown Dining Week. This is foodie heaven time because for $15, $25 and $50, the participating restaurants will be offering fabulous custom menus for these affordable prices. Make your reservations early to avoid disappointment as with each passing year, the event gets more and more popular with savvy diners. Dine out to win awesome prizes, including the Grand Prize of a multi-course Dinner for Four at The Marc, with matching wines by deVine Wines & Spirits. 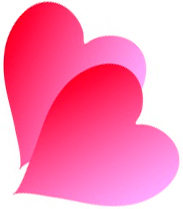 You will receive a secret code with your bill at a participating restaurant, which can be entered at the Edmonton Journal Contest Page .. here.. Some of the best restaurants in town are involved. Check out the participating restaurants and their respective menus here.. here..
Visit the Edmonton Downton Business Association website here..
Our Top Drops series that focuses on top drawer wines has been immensely popular over the last several years. We’ve got some doozies planned for 2012. You’re all probably were aware that deVine proprietors Ed Fong and Annabelle Evaristo visited Germany extensively last summer and the fruits of their winery visits have finally arrived. Over 50 exclusive new products are now on our shelves and this is Riesling heaven for the lover of that grape. In a rare white wine Top Drops, please join Ed and Annabelle on Saturday, March 31 for the wines of the Nahe, located in south-west Germany in the first of a series of Top Drops Germany over the course of 2012 including the Mosel, Rheingau and Rheinhessen regions to come. 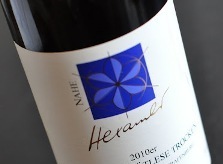 Featured will be the wines from the legendary and probably most sought after German producer overall, Helmut Donnhoff along with neighbours Helmut Hexamer and Emrich-Schonleber. We will be serving German food with this small and intimate sit-down tasting for 18 people – this event is already more than half full so register now to avoid disappointment. Book your spot here..
For April, we visit France and Bordeaux. The trio of Bordeaux vintages 2008, 2009 and 2010 is an exact replay of 1988, 1989 and 1990, the last time that we saw three great vintages in succession.The 2008’s will be forever in the shadow of the two subsequent campaigns, but the astute buyer will see it as an opportunity to score some deals (although when it comes to Bordeaux, it is all relative when you talk pricing). The Merlot based Pomerol region reigns supreme in 2008, but there are some excellent St. Emilions and some very fine left bank wines too. Join us for a detailed sampling of high end 2008 Bordeaux. Only 18 seats in this sit-down event, so grab your spots early to avoid disappointment. Book your spot here..
We hope to see some of you at one of these upcoming Top Drops events. In order to grow and move to the next level of wine enjoyment, you must taste better and better wines and expand your palate. Top Drops will take you to that next level of wine appreciation. Sparkling Wines: – Bubbles are a must for any special celebration with Champagne being the ultimate. 1) NV Rolet Cremant du Jura Brut Rosé – $24.99 – lovely salmon colored sparkler that works with appetizers. 2) 2010 Michele Chiarlo Nivole Moscato d’Asti (375mL) – $15.99 – for those with a sweet tooth, this is light as a feather, amazing perfumy nose and sweet – an awesome pairing with fresh strawberries at the beginning or at the end of that special meal. 3) NV Gremillet Brut Rosé Saignee – $56.99 – stunning pink/ruby in color, this Champagne sings with rustic acidity, startling dryness – stellar look that impresses and well priced for Champagne. 4) 1998 Veuve Clicquot La Grande Dame Brut – $254.99 – one of the great names in Champagne, the orange label house, this is the top of the heap, the creme de la creme from Veuve. Its got complexity from aging and is drinking extremely well now. Elegant and sophisticated with obvious breed. 1) 2009 Domaine Bernard Defaix Chablis – $26.99 – slatey and minerally Chardonnay that works well with food, from the great 2009 French vintage. 2) 2010 Emrich-Schonleber Monziger Fruhlingspatzchen Riesling Trocken – $39.99 – a minerally, dry German Riesling. Pair with food – this is for those that are non-believers or have never had a stellar Riesling, this will be your Riesling epiphany..
3) 2009 Zind-Humbrecht Riesling Clos Hauserer – $60.99 – from the first Master of Wine in Europe, Zind-Humbrecht is one of the most respected producers in the world. Only slightly off-dry, lots of exotic fruit and layers of complexity. 1) 2008 Umani Montepulciano d’Abruzzo Jorio – $19.99 – one of deVine’s favourites of late, this takes pizza and spaghetti wine to a new level. 2) 2008 Quiinta do Crasto Reserva Old Vines – $42.99 – Wine Spectator Top 100 wine that shines with an hour of decanting. Perennial favourite and consistently outstanding. 3) 2008 Keenan Cabernet Franc – $78.99 – fabulous Napa red that is distinctive and unsual, 100% CabFranc, stunning nose of flowers and violets and fruit aplenty that lingers on and on. Red meat pairing. 4) 2006 Leonetti Merlot – $99.99 – from a Washington producer famous for producing world class Merlot. Soft and velvety. Watch ‘Sideways’ with a bottle of Leonetti and you’ll not look at Merlot the same ever again. 5) 2001 Lisini Brunello di Montalcino Ugolaia – $149.99 – from the legendary 2001 vintage for Brunello’s, this single vineyard red will drink well with an hour’s decant and some braised meats. Fabulous sangiovese. 6) 1994 Dominus – $349.99 – A legendary American wine, one of the all time greats, the 1994 is near perfection and drinking magnificently. From Christian Moueix of Petrus fame. 7) 1983 Chateau Margaux – $1,199.99 – for those where money is no object, the 1983 Margaux has long been a favourite for any lover of Bordeaux from the Margaux appellation. Heralded as good as the 1982, this is singing right now, but will keep for another 20 years easily. Delicate yet powerful, classy and expressive, everything an aged First Growth Bordeaux should be. A memory maker. 1) 2009 Quady Elysium Black Muscat – 375mL – $13.99 – Lovely and inexpensive and one of the best wines to pair with chocolate based desserts. 2) 2007 Rudolf Rabl Riesling Trockenbeerenauslese – 375mL – $47.99 – a stellar Austrian white to be paired with fruit based desserts, the exotic tropical fruit and scintillating acidity make for a memorable combination of smell and taste. 3) 2004 Trabucchi Recioto della Valpolicella – 500mL – $61.99 – for chocolate or some blue-veined cheese and nuts, this is a comtemplative red dessert wine that calls for snuggling by the fireplace. 4) 2003 Chateau d’Yquem – 375mL – $329.99 – when only the best will do – d’Yquem is generally recognized as the best dessert wine in the world, and this out of this world stickie will stay with you for days. Serve closer to room temperature than fridge cold, by itself or with cambozola. A memorable end to any evening!